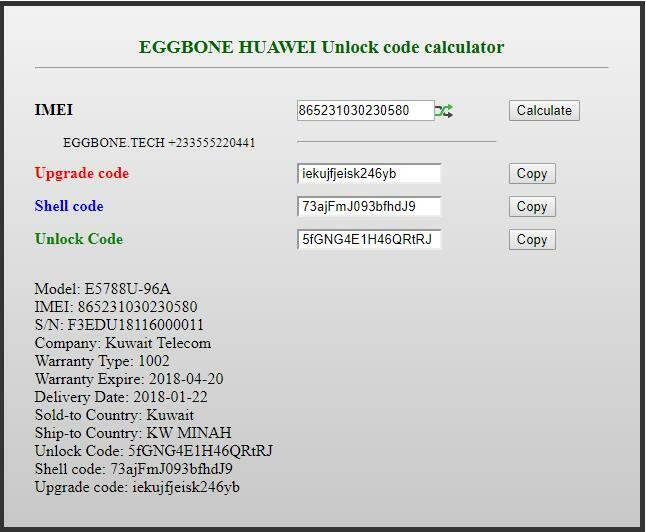 We can provide any level / version of huawei unlock code via IMEI. 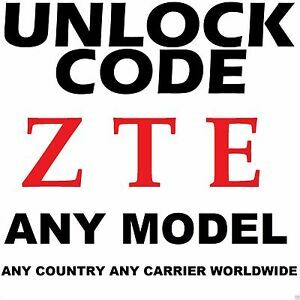 We can provide Algo V1, V2, V3, V4, & V5 via IMEI. 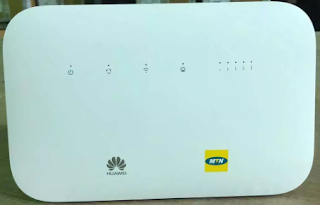 In order to receive a network unlock code for your HUAWEI Modem, Mifi, Router, Phone, etc. 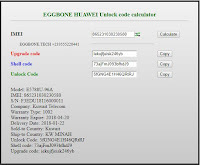 you need to provide IMEI number (15 digits unique number). 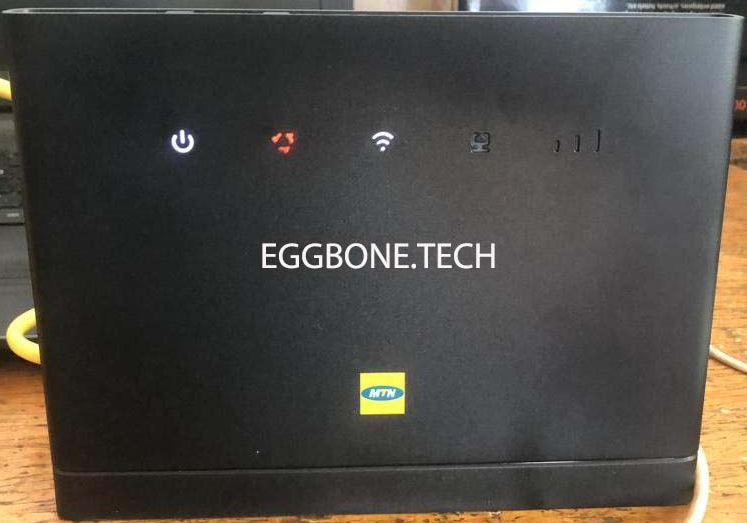 It can be found by dialing *#06# as a phone number, as well as by checking in the settings of your device or back-cover of the device / looking under the battery as of modem, wingle, mifi or router. Megafon MR100-3, Megafon M100-4, МТС 824F, МТС 824FT, Huawei E3272, Мегафон M100-4, Huawei E3272s-153, Beeline E3272, Huawei E3272s-210, Huawei E3272s-600, MTS 823F, МТС 826FT, Мегафон М21-4, Megafon М21-4, Huawei E5372, Huawei E5372s-601, Huawei E5372 Fastlink, Huawei E5372s-22, Huawei E5372s-32, Huawei E5372Ts-22, Huawei E5372Ts-32, МТС 423S, Huawei E8231, Huawei E3272s, Huawei E8231s-2, Huawei E5330, Huawei E5330As-2, Huawei E5330Bs-2, Huawei E5330Bs-6, Билайн E3272, and many more. Huawei E3372h-210, E3372h-607, Huawei E5577s-603, E3372h, E8372h-153, Huawei E5783h-92a, E8372h-608, Huawei E3372h-153, E8372h, E5783h, Huawei E8372h-609, Huawei E5783, E8377, E5573s-606, E5573s, MTS 827F, Huawei E8372h-510, E5573, Huawei E8372h-155, MTS 829F, E5573s-156, Huawei B310s-925, Huawei E8372h-511, E5573s-320, Huawei E5573Cs-509, E5573s-606, Huawei E8372h-607, Huawei E8372h-927, МТС 8211F, Huawei E3372h-603, E5771s, Huawei E5771, E5573s-508, Huawei E5573s-607, E5577, Huawei E5771h-937, МТС 827F, Huawei E5573s-852, MTS 8211F, Huawei E5573s-853, МТС 8210F, Huawei R216, E5573Cs-609, Huawei E5577Ds-156, Huawei E5573Cs-323, E5573s-806, Huawei E5573Cs-931, E8377s-153, Huawei E5575s-210, E5573s-609, Huawei E5575S-302, MTS 8210FT, Huawei E5575S-320, E5577Bs, MTS 829F, Huawei E5578s-932, E5577Bs-937, Huawei E3372h, E5577Bs-932, Huawei E5770s-923, МТС 8210FT, Huawei E5770s-320, E5578s, E5573Cs-322, Huawei E5577Cs-603, E5573s-856, Huawei E5787s-33a, B315s-936, Huawei E5578, E5573Cs, Huawei E5330Cs-82, E3370h, Huawei E8378Ws–210, E5577s-932, Huawei E5771s-852, Huawei E5575, E3372h-510, Huawei E5785, E5785Lh, Huawei E5785Lh-23c, B68A-24, E5577s, Huawei E5787, E5575s, Huawei E5771, E5573Bs-320, Huawei B315s-608, B315s, Huawei B315s-607, B310s, Huawei B310As-852, E8378Ws, E5878, Huawei B310s-518, E5770s, Huawei E5770, B310, Huawei E8378Ws-210, , E3370, E5577s-321, B315, B310s-927, E5573Cs, B310s-925, B310s-22, E5577Cs-321, and many more. B520S-93A, B520S-93A, B525s-23a, B525s-65a, E5885Ls, B525s-95a, B528s-23a, B529s-23a, B610s-76a, B610s-77a, B612s-25d, B612s-51d, B618s-22, B618s-22d, B525S-23A, E5885, 501HW, 603HW, E5787, B520, B715, E5771, B612, B610, B882, B528, B529, E5783, E8378, E8231, B593, 601HW, E5788, R218H, E5787, E5573Bs-322, E5383s-327, E8231s-2, EG860, eA660, B222s, B818, eA380, B5338, eA280, eA360, EMobile GL04P, E5885Ls, E5786S, E5771h, R227h, 506HW, 603HW, E8377, B311s-220, B311Bh-37, B311As-853, B311Ah-35, B315s-938, R226, R215, R210, E5573Cs-933, Huawei E5785Lh-92a, E5788, EC5377, B715S-23C, B715S-23, B715S, E5785Lh-23c, E5785Lh-67a, B2368-66, B2368-22, B2368, E5787Ph-92a, E5785Lh-22c, E5788U-96A, Vodafone B3500, E5577Fs-932, Huawei E5788u, Huawei E5885Ls-93a, Huawei B528s-23a, Huawei E5788, Vodafone B4000, Vodafone B3000, Huawei B529s-23a, Huawei B610s-76a, Huawei B610s-77a, Huawei B612s-25d, Vodafone B1000, Huawei B5328-58, Huawei B5328-155, Huawei B5318-42, GL06P, GL10P, GL01P, 102HW, E5788U, HWD37, HWD36, 604HW, E5785, Huawei E5785Lh-67a, Huawei E8378,E5785Lh-22c, E5785, E5785Lh, B618s-65d, Huawei B618s, Huawei B525s-65a, Huawei B525s-95a, 22d, E5885, E5786s-32a, E5786s-62a, E5786s-63a, E5573Bs, Huawei B520S-93A, Huawei B520S-93A, Huawei B525s-23a, Huawei B525s-65a, Huawei B618s-22, Huawei B525s-95a, B612S-52D, Huawei B612s-51d, and many more. A100, ALE-L21, Ascend 8836D, Ascend D2, Ascend G300, Ascend G312, Ascend G350, Ascend G500, Ascend G510, Ascend G526, Ascend G6, Ascend G600, Ascend G610, Ascend G620, Ascend G620S, Ascend G630, Ascend G7, Ascend G7-L01, Ascend G700, Ascend G710, Ascend G730, Ascend Mate, Ascend Mate 2, Ascend Mate 7, Ascend P1, Ascend P1 LTE, Ascend P1 XL, Ascend P2, Ascend P6, Ascend P7, Ascend W1, Ascend XT, Ascend XT2, Ascend Y100, Ascend Y200, Ascend Y201 Pro, Ascend Y210, Ascend Y215, Ascend Y220, Ascend Y221, Ascend Y300, Ascend Y320, Ascend Y321, Ascend Y330, Ascend Y511, Ascend Y520, Ascend Y530, Ascend Y540, Ascend Y550, Ascend Y600, ECO, EG162, EG162G, EG602, EG602G, Elate, EM121, EM200, EM300, EM310, EM700, EM730J, EM730V, EM770, EM770, EM770J, EM770M, EM770V, EM770W, EM772, EM775, EM820u, EM920, EM930, Enjoy, 5s, ETS-310, ETS-388, ETS-668, ETS-678, ETS-688, ETS-878, ETS1160, ETS3, ETS3125i, ETS6630, F111, F316, F317, F317-20, F317-30, F317-40, F362, F362-20, F362-30, F385, F610, FC312e, Fusion 2, G Play Mini, G20, G2100, G2200, G2800, G2800S, G300, G330d, G3501, G3511, G3512, G3512D, G3610, G3620, G3620L, G3621, G3621L, G3622, G500 Pro, G5010, G526-L22, G535, G5500, G5510, G5520, G5521, G5726, G5730, G600, G6005, G6006, G6007, G6150, G6151, G620-UL01, G620S, G6210, G630-U251, G635, G6600, G6602, G6603, G6605, G6608, G6609, G6610, G6620, G6622, G6800, G7002, G7007, G7010, G7105, G7206, G7210, G7220, G7220w, G7300, G740, G7510, G7600, G7720, G8, Gaga, GEM-702L, GEM-703L, GL10P, GR5, GT3, H1611, H1711, H1711z, H30-L01, H30-L02, H715BL, H867G, Honor, Honor 2, Honor 3, Honor 3C 4G, Honor 3C LTE, Honor 3C Play, Honor 3C TD-LTE, Honor 3X G750, Honor 3X Pro, Honor 4 Play, Honor 4C, Honor 4X, Honor 5, Honor 6, Honor 6 Plus, Honor Holly, Honor Table, Honor Tablet T, Honor X1 7D, 591u, Honor Y6, HW-01C, Ideos, Ideos S7, Ideos X1, Ideos X3, Ideos X5, Ideos X6, Impulse 4G, INQ Chat 3G, iNQ Mini 3G, Inspira, Inspira H867G, K3770, K3772, K4505, Kanguru, LUA-L02, LUA-L03, LYO-L02, M228, M318, M328, M660, M735, M750, M860, M865 Muve, M920, M931, Mate 10, Mate 10 Pro, Mate 8, Mate 9, Mate 9 Pro, MediaPad, MediaPad 10, MediaPad 10 FHD, MediaPad T1, MediaPad T3, MediaPad X1, MediaPad X2, MomoDesign [email protected] HSUPA, MT1-U06, MT2-L03, MU609, N907, Nexus, 6P, NH3-U00, NMO-L22, Nova Plus, Orange Panama G7210, Orange Tactile TV, P Smart, P10, P10 Lite, P10 Plus, P20, P20 Lite, P20 Pro, P8 Lite, P8 Lite Dual, P8 Max, P9, P9 Lite, P9 Max, P9 Plus, Panama, RBM2, S7-303u, S7-931U, S7-932U, SCL-L02, Sensa, Sonic, Speed,, T-Mobile Comet, T-Mobile Pulse, T-Mobile Pulse Mini, T-Mobile TAP, T1-701u, T1-A21L, T156, T158, T161L, T201, T202, T208, T210, T211, T261L, T300, T330, T353, T520, T521, T566, Tactile TV, TAG-AL100, TAG-L03, U1000, U1100, U120, U120e, U121, U1211, U1215, U1220s, U1250, U1270, U1300,, U1310, U2800, U2800A, U2801, U2805, U3200, U3205, U3300, U5130, U5130-05, U5130-7, U526, U528, U5700, U5707, U5900, U6150, U626, U636, U7310, U7510, U7519, U7520, U8100, U8110, U8150, U8160, U8180, U8185, U8220, U8230, U8300, U8320, U8350, U8500, U8510, U8520, U8600, U8650, U8651, U8651T, U8655, U8665, U8666-1 (Ascend Y201), U8667, U8680, U8681, U8686, U8687, U8730, U8800, U8815, U8825d, U8836D, U8850, U8860, U8860 Honor, U8950D, U8951, U9000 Ideos X6, U9150, U9200, U9201L, U9500 D1, U9508, UM840, UMG 587, UMG1691, UMG181, UMG1831, UMG366, UMG587, UML397, Valiant, Vision, Vision 3 LTE, Vision U8850, Vitria Y301-A2, VM720, W1-U34, W2, WebCube 4, Y220-U00, Y220-U05, Y220-U07, Y220-U17, Y221-U03, Y221-U12, Y221-U22, Y221-U53, Y3 II, Y300, Y301-A1, Y310, Y320-U10, Y330-U01, Y330-U05, Y330-U07, Y336-A1, Y336, U02, Y360, Y360-U31, Y360-U72, Y360-U93, Y3II, Y5 II. Y520-12, Y520-U03, Y520-U12, Y520-U33, Y530-U051, Y536A1, Y540-U01, Y560-L01, Y560-L02, Y560-U03, Y6, Y6 Elite, Y6 Pro, Y6 Scale, Y625, Y625-U21, Y625-U32, Y625-U43, Y625-U51, Y635 and many more! 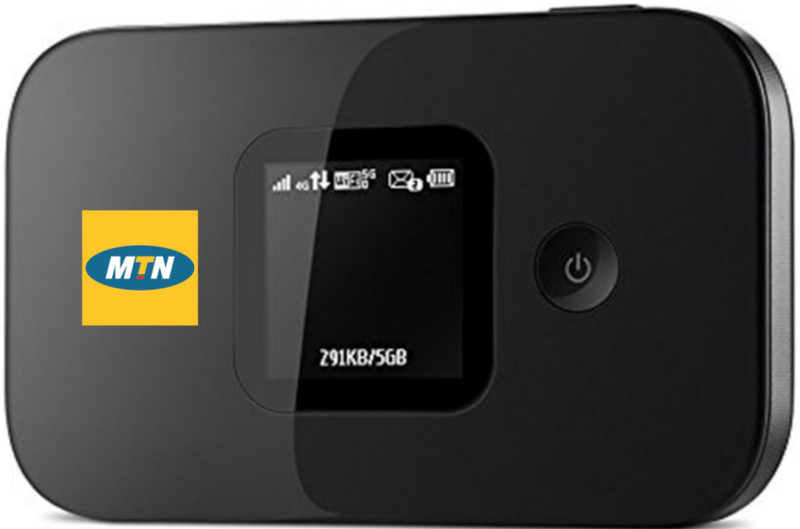 We also provide NCK / unlock code for all Alcatel modems, wingles, mifi and routers. 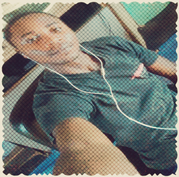 In order to receive a network unlock code for your Alcatel Modem, Wingle, Mifi, Router, etc. you need to provide IMEI number (15 digits unique number). It can be found by checking in the settings of your device or back-cover of the device / looking under the battery. 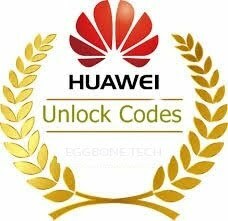 Unlocking Alcatel Modem, Wingle, Mifi, Router, etc. 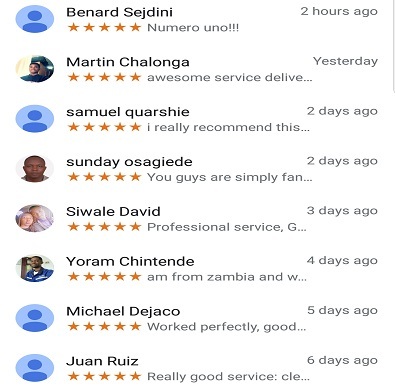 by code is the easiest and fastest way to make your device network free. It doesn't interfere in your system or change it in any way so even after using our code, you will not loose warranty. 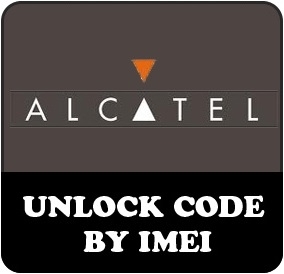 Our Alcatel NCK / unlock code works for all Alcatel modems, wingles, mifi and routers. ZTE Mobley VM6200, Pocket WiFi GL09P, Ymobile Pocket WiFi 305ZT, Softbank Pocket Wi-Fi 304ZT, Softbank Pocket Wi-Fi 303ZT, SoftBank Pocket Wi-Fi 102z, T-Mobile Sonic 2.0, MF79S, T-Mobile Z915, Vodafone R230, Vodafone R216z, Vodafone R212, MF288, MF275R, MF29T, MF29S2, MF28B, MF28D, MF28G, ZTE MF282 3HUITube, MF287, MF275U, MF286, MF285, MF283, MF253, MF25D, MF28D, MF903, Orange Reyo, Orange Zali, T-Mobile MF195, Verizon Wireless AC30, Verizon Wireless MF271 (Z700) AT&T USA, Verizon Wireless MF96/MF96U T-Mobile USA, Vodafone R206-Z, Vodafone R302-Z, Vodafone Smart Tab 10, Vodafone Smart Tab 7, ZTE 1, ZTE 151, ZTE 547, ZTE 551, ZTE 810, ZTE 811, ZTE 881, ZTE A100, ZTE A12, ZTE A139, ZTE A16, ZTE A18, ZTE A19, ZTE A236+, ZTE A261, ZTE A261+, ZTE A300, ZTE A316, ZTE A36, ZTE A452, ZTE A475, ZTE A515, ZTE A610, ZTE A70, ZTE A80, ZTE A800, ZTE A81, ZTE A810, ZTE A86, ZTE A88, ZTE A89, ZTE A96, ZTE A99, ZTE Aeon, ZTE Altair, ZTE Altair 2, ZTE AMIGO, ZTE Avail, ZTE Avail 2, ZTE Avid 4, ZTE Avid Plus, ZTE Avid Trio, ZTE Axon, ZTE Axon Pro, ZTE AZ210A, ZTE B112, ZTE B792, ZTE B795, ZTE B815, ZTE Base Lutea, ZTE Blade, ZTE Blade 3, ZTE Blade 5L, ZTE Blade A110, ZTE Blade A3, ZTE Blade A320, ZTE Blade A410, ZTE Blade A450, ZTE Blade A462, ZTE Blade A465, ZTE Blade A475, ZTE Blade A5 Pro, ZTE Blade A512, ZTE Blade AF3, ZTE Blade Apex, ZTE Blade Apex 2, ZTE Blade B112, ZTE Blade C2, ZTE Blade C2 Plus, ZTE Blade C341, ZTE Blade D, ZTE Blade D Lux, ZTE Blade D6, ZTE Blade D6 Lite 3G, ZTE Blade D6 Lite H LTE, ZTE Blade D6 Lite L LTE, ZTE Blade G, ZTE Blade G Lux, ZTE Blade G Plus, ZTE Blade G PRO, ZTE Blade II, ZTE Blade L2, ZTE Blade L3, ZTE Blade L370, ZTE Blade L4 Pro, ZTE Blade L5, ZTE Blade L6, ZTE Blade Q, ZTE Blade Q Lux 3G, ZTE Blade Q Maxi, ZTE Blade Q Maxy, ZTE Blade Q Mini, ZTE Blade Qlux 4G, ZTE Blade S6, ZTE Blade S6 plus, ZTE Blade Spark, ZTE Blade V, ZTE Blade V220, ZTE Blade V580, ZTE Blade V6, ZTE Blade VEC, ZTE Blade VEC 4G, ZTE Blade X, ZTE Blade X Max, ZTE Blade X7, ZTE Blade XM, ZTE Blade Z Max, ZTE BlueBelt I, ZTE BlueBelt II, ZTE Boost Icon Nero, ZTE Boost Luna, ZTE Boost Max+, ZTE Boost Zume 5, ZTE C2 Plus, ZTE C310, ZTE C3701A, ZTE CE1588, ZTE Citrine LTE, ZTE Concord, ZTE Concord II, ZTE Concore , ZTE Concore II, ZTE Conexis A1, ZTE ConeXis X1, ZTE Cute N281, ZTE Cymbal Z-320, ZTE D286, ZTE Delta, ZTE E10Q Venezuela, ZTE E110 ZEST, ZTE E3, ZTE E810, ZTE E811, ZTE E821S, ZTE Eclipse, ZTE F100, ZTE F102, ZTE F120, ZTE F160, ZTE F165, ZTE F188, ZTE F230, ZTE F233, ZTE F286, ZTE F310, ZTE F320, ZTE F327s, ZTE F555, ZTE F600, ZTE F608, ZTE F866, ZTE F868, ZTE F870, ZTE F930, ZTE F950, ZTE F951, ZTE Falcon, ZTE Fit 4G Smart, ZTE Fury, ZTE G-N 281, ZTE G-N 290, ZTE G-N260, ZTE G-N281, ZTE G-N295, ZTE G-R222, ZTE G-R228, ZTE G-R231, ZTE G-R236M, ZTE G-R250, ZTE G-R260, ZTE G-S203, ZTE G-S213, ZTE G-S215, ZTE G-S511, ZTE G-S512, ZTE G100, ZTE G230, ZTE G66, ZTE G70, ZTE G90, ZTE G92, ZTE GL09P Pocket WiFi, ZTE GR221, ZTE GR230, ZTE GR231, ZTE GR321, ZTE Grand Era, ZTE Grand M, ZTE Grand Memo, ZTE Grand S, ZTE Grand S Flex, ZTE Grand X, ZTE Grand X IN, ZTE Grand X Max 2, ZTE Grand X Max+, ZTE Grand X Plus Z826, ZTE Grand X Quad Lite, ZTE Grand X View, ZTE Grand X2, ZTE Grand X4, ZTE Grand XM, ZTE GS202, ZTE GS505, ZTE GX670, ZTE GX671, ZTE GX760, ZTE GX761, ZTE GX930, ZTE Hop Smart, ZTE HotSpot Z64, ZTE i610, ZTE i620, ZTE i70, ZTE Icon Nero, ZTE Joy A1, ZTE Joy A3, ZTE K4201, ZTE K4201-Z, ZTE K4505-Z/P680A2, ZTE K4510-Z, ZTE K4607-Z, ZTE K5006-Z, ZTE K5008-Z, ZTE K85, ZTE K88 Tab, ZTE Kis, ZTE Kis 3, ZTE Kis 3 max, ZTE Kis III, ZTE Kis Pro, ZTE Kis Q, ZTE Kiss II Max, ZTE L110, ZTE L111, ZTE LF152, ZTE Libra, ZTE Light, ZTE Light Pro, ZTE Light Tab V72A Aio USA, ZTE Link, ZTE Majesty PRO, ZTE Maven, ZTE Maven 2, ZTE Maven 3,ZTE Max, ZTE Max Duo, ZTE Max XL, ZTE MEGAFON CP09, ZTE Mercury, ZTE MF100, ZTE MF190, ZTE MF193, ZTE MF197, ZTE MF25, ZTE MF253, ZTE MF25A, ZTE MF271, ZTE MF271A, ZTE MF275U, ZTE MF283, ZTE MF28B Rogers, ZTE MF28D, ZTE MF28G, ZTE MF29, ZTE MF60, ZTE MF61, ZTE MF626, ZTE MF627, ZTE MF63, ZTE MF631, ZTE MF636, ZTE MF637, ZTE MF64, ZTE MF65, ZTE MF65M, ZTE MF667, ZTE MF70, ZTE MF710, ZTE MF730, ZTE MF730M, ZTE MF75, ZTE MF821, ZTE MF823, ZTE MF83, ZTE MF833, ZTE MF83M, ZTE MF90, ZTE MF90+, ZTE MF91, ZTE MF910, ZTE MF910+, ZTE MF910V, ZTE MF915, ZTE MF920, ZTE MF923,ZTE MF93, ZTE MF93D, ZTE MF96, ZTE MF96A, ZTE MF96G, ZTE MF96U, ZTE MF971VS, ZTE MF975S, ZTE MF97A, ZTE MF97B, ZTE Mimosa Mini, ZTE Mimosa X, ZTE MOMODESIGN MD Smart, ZTE Mustang, ZTE N261, ZTE N281, ZTE N285, ZTE N285 Vega, ZTE N290, ZTE N295, ZTE N61, ZTE N799D, ZTE N800, ZTE N810, ZTE N850, ZTE N850L, ZTE N9101, ZTE N9130, ZTE N9132, ZTE N9510, ZTE N9511, ZTE N9515, ZTE N9516, ZTE N9520, ZTE Nubia 5, ZTE Nubia X6, ZTE Nubia Z5, ZTE Nubia Z5S, ZTE Nubia Z5S Mini, ZTE Nubia Z7, ZTE Nubia Z7 Max, ZTE Nubia Z7 Mini, ZTE NX403A, ZTE NX405H, ZTE NX501, ZTE Obsidian, ZTE Open, ZTE Open C, ZTE Orange Hollywood, ZTE Orange Lisbon, ZTE Orange Miami, ZTE Orange Rio, ZTE Orange Rome, ZTE Orange Rono, ZTE Orange San Francisco, ZTE Orange VEGAS, ZTE Overture 2, ZTE Overture 3, ZTE P726N, ZTE P728b, ZTE P729B, ZTE P743t, ZTE P752D, ZTE Prelude, ZTE Prestige, ZTE R206, ZTE R206-Z, ZTE R212, ZTE R216-Z, ZTE R220, ZTE R221, ZTE R222, ZTE R225, ZTE R236, ZTE R250, ZTE R255, ZTE R259, ZTE R260, ZTE R28, ZTE R286, ZTE R3100, ZTE R55, ZTE R620, ZTE R621J, ZTE Racer, ZTE Radiant, ZTE Raise, ZTE Revvl Plus, ZTE Rio 2, ZTE Rio II, ZTE RL500, ZTE Rockstar M131, ZTE S155, ZTE S183, ZTE S202, ZTE S202 Simply, ZTE S302, ZTE S309, ZTE S519, ZTE S521, ZTE S522, ZTE SAGE, ZTE San Francisco, ZTE San Francisco II Crescent, ZTE Script 64, ZTE SFR 114, ZTE SFR 115, ZTE SFR 231, ZTE SFR 232, ZTE SFR 241, ZTE SFR 251, ZTE SFR 251 Messenger, ZTE SFR 261, ZTE SFR 341, ZTE SFR 342, ZTE SFR 343, ZTE SFR 522, ZTE SFR 552, ZTE SilverBelt, ZTE Skate, ZTE Skate Pro, ZTE Skinny, ZTE Skinny F328, ZTE Skinny S50, ZTE Smart First 7, ZTE Soft Stone, ZTE Solar, ZTE Sonata 2, ZTE Sonata 3, ZTE Sonata 4G, ZTE Soshphone 4G, ZTE Source, ZTE Spro 2, ZTE Star 1, ZTE Staraddict II, ZTE Startext 2 by SFR, ZTE Sydney, ZTE T Mobile E200 Vibe, ZTE T Mobile Vairy Touch, ZTE T Mobile Vairy Touch II, ZTE T-Mobile Beat, ZTE T12, ZTE T126, ZTE T165, ZTE T2, ZTE T20, ZTE T202, ZTE T203, ZTE T22, ZTE T28, ZTE T3, ZTE T3020, ZTE T303, ZTE T4, ZTE T403, ZTE T50, ZTE T520, ZTE T54, ZTE T55, ZTE T610, ZTE T760, ZTE T790, ZTE T792, ZTE T80, ZTE T809, ZTE T81, ZTE T815, ZTE T82, ZTE T83, ZTE T870, ZTE T930, ZTE T96, ZTE T98, ZTE Tactile Internet 2, MF971V, ZTE Tania, ZTE Tara 3G, ZTE Telstra Cruise, ZTE TELSTRA SMART TOUCH T3020, ZTE TMN 11, ZTE TMN Sapo A5, ZTE TMN Softstone, MF17T, ZTE TMN1200, ZTE TMN1210, ZTE TMN500, ZTE TMN5000, ZTE Tuckcell T50, ZTE Tureis, ZTE U V880, ZTE U X850, ZTE U289, ZTE U895, ZTE Universal Music Phone, ZTE V11A, ZTE V170, Many more supported.